A nylon tent has its place if you have to strap it on your back and hike it up a mountain, but has no business on the back of your truck. This durable, canvas, truck tent will long outlive cheaper-made nylon and polyester tents. 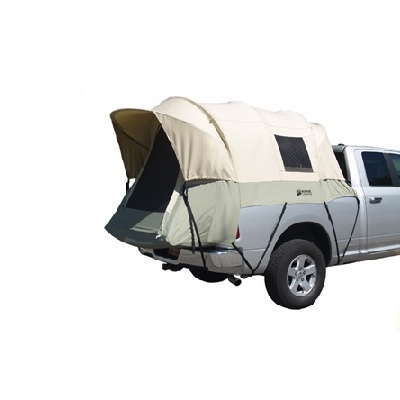 Pitch your tent anywhere your truck goes and enjoy an elevated bed canopy while you camp out. Keep off the ground, high and dry, and away from the critters. Made with Hydra-Shied 100% cotton duck canvas that is durable, watertight, and breathable. Our unique clamp-on rail design offers an easy and secure setup. Features five windows with no-see-um mesh, for ventilation, light, and openness. Has a cab access window. You can run a power cord from your cab to power your appliances. Has sturdy shock-corded fiberglass poles and top-of-the-line YKK zippers and steel poles for the main structure. Roomy 5 Ft. interior ceiling height. Sets up with the tailgate down for added space. Convenient gear pockets. Carry bag included. Model 7206 is similar to the previous model 7106. Limited Lifetime Warranty. The 7206 Kodiak truck tent kit comes with a limited lifetime warranty from the manufacturer, Kodiak canvas. *Low price guarantee offer on these kits is subject to product availability and manual review of the competitor offering. Call for details. Rugged 8.5 oz. 100% cotton duck canvas cover construction. 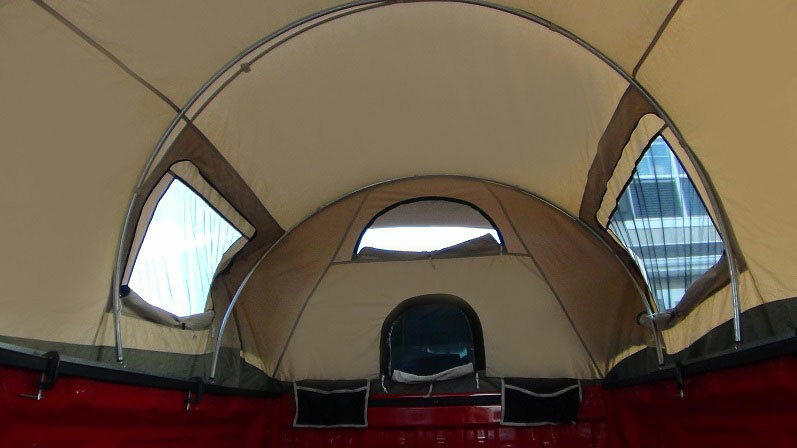 5 windows provide excellent ventilation and openness for an avid camper. Cab access window. Tunnel shaped design maximizes interior space. Tall 5 Ft. ceiling height. Tailgate down design expands useable space. Clamp-on rails easily mount on the truck bed for a secure fit. Large D-shaped door with top rated YKK zippers. Covered entry. Two sewn-in gear pockets. Carry Bag included. Weight: approx. 41 lbs. This product fits full-size trucks (short bed). Fits Dodge Ram, Toyota Tundra (does not fit the Tacoma), Nissan Titan, Chevrolet Silverado, and Ford F. Series. Does not fit the Ridgeline or Avalanche. 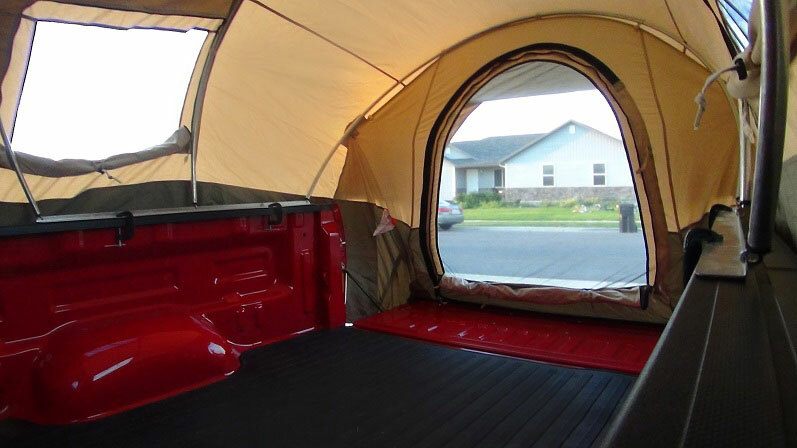 Get the unmatched quality of a Kodiak Canvas tent for your pick up truck. This is absolutely the best truck tent on the market. We personally love our truck tent. It kept us off the ground which is what we wanted and did not take up any extra space other than our truck space. The Kodiak truck tent is great. It is completely water repellent and fits my Toyota Tundra well. Once you assemble the tent for the first time you will easily be able to assemble and disassemble the tent in under 10 minutes. I will get a lot of use out of this tent and would highly recommend it to a friend. This truck tent is great. Good quality canvas tent. We put it on our truck and now we cant wait to go camping !!!!!! We are very happy. Q: Is this only for short bed? A: What's your make and model and size of bed? Q: Fit guide says up to 6 1/2 ft bed. Also says Ford F series. Will it fit correctly on F250 bed 6 ft 8 in? Will that stretch it out too much? Pics on this truck? Q: I ordered a 7206 8 days ago and haven’t received any updates as of yet. Can you advise, please? A: As advertised this is still on backorder until about 4-15. Q: I live in British Columbia Canada. I am wanting to purchase a Kodiak truck tent for my Chev Silverado 3500 HD. The website says they wont be available for shipping until 15/04/2019. Do you know how long it will take to ship here to Canada. Planning on using it the last weekend in April so would I be cutting it too fine time wise ? A: Shipments to Canada take between one and two weeks to receive. Tracking will be emailed to you automatically just as soon as it ships out. Feel free to contact us with any other questions. Q: wanting to use for hunting,can you drive with it attached and how fast ? A: No, it is not something you would want to drive with unless you are driving very slowly around 5 to 10 mph. Otherwise it could damage the tent. You can drive a little bit faster if you lay down the shell of the tent-even while it is attached so that you can pop it back up relatively quickly once you've changed your hunting spot. Q: Do you have a tent that will fit in a 2005 Ford Ranger Long Bed regular cab? A: The closest we have is model 7211 which fits a midsize bed of the Ford Ranger. We don't have anything for a long bed Ford Ranger. A: We do ship to Canada, however, the freight can be a bit pricey. To determine the freight please add the item to your cart and enter your postal code. A: That's a good question, you would need to call that one in as we would likely need more information. A: These are now available. Q: Does it come in a longer length? A: Yes, model 7218 is the eight-foot version. Feel free to contact us with any other questions. Q: Does this tent have a bottom? A: Yes, it definitely does have a vinyl floor which is very nice and thick. A: The truck bed is the bottom-it is not include a type of floor-it's assuming that the truck bottom will be the floor. Q: I have a 2006 Dodge Ram Mega cab. The bed is 6’2” will the tent fit? Q: Will this fit a 2015 Ram 2500 with a RamBox? Q: I have a 2017 Frontier crew cab short box with cover on bed. It folds up to 1/3 of cover. Will your tent fit and will it work with the cover rolled up to front of bed 1/3? A: Yes, based on your description I believe this product will work just fine. Feel free to contact us with any other questions. A: No it does not fit the Ridgeline. The Ridgeline has a sloping bed rail and our 7206 needs a flat rail to mount to. Q: My F150 has a short bed which is 5'7". With the tailgate down, the length is 7'8". Will the tent extent and cover the tailgate? A: Yes, it would work. A: Yes, you would have to remove the rolling lock cover. 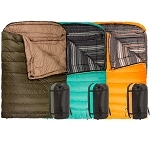 The tent bag is about 30 inches long x about 12 inches high and 12 inches wide. The first thing putting it up is a learning experience only because you have to position the part that goes on the rail perfectly and chances are you'll have to move it forward or backward and you can only figure that out once you're putting it up the first time. After that it's pretty easy. Q: Will this fit a 1950 Chevy truck? A: We have tents that will fit a Chevy Silverado, or a Chevy Colorado. Unless the older model is significantly different than these, then one of the tents should work. Please see the comparison chart for the correct model. Q: Will it fit a 2017 Honda Ridgeline? A: We haven't checked the new model yet, but they wouldn't work with the previous Honda Ridgeline. Q: Do you send to Canada and what is the cost to do this? A: Yes! we can ship to Canada, but not with free shipping. To calculate your shipping cost just add the item to your cart, input your country, province and postal code, and it will calculate your shipping. I estimate it will be around $75. You are welcome to order with that, or if you would prefer, we can prepare you a special quote, and cover part of the shipping cost (The cost we normally pay.) If you would like this option, then please email us at support@competitiveedgeproducts.com Please include your name, address, the model and quantity of the product, and a phone number will also be helpful. Additionally, you can call us at 866-308-5484 to get a discount. Q: Will it fit a 1997 Ford Ranger Stretch cab? A: The 7211 will fit a Ford Ranger. A: You definitely cannot drive with a tent on the truck. It will damage the tent. Q: I have the 1999 Chevy S10 the bed is about 60 inches wide and about 7 feet long. and going full time for 4 months from June to end of September... so need to be able to leave it on the truck while driving... is this possible? A: t will work with a Chevy Silverado, but you will want to call 801-508-2880 to confirm. Driving is not recommended unless you are going very very slow. The design of the tent almost acts like a parachute should you drive any faster than, say, ten miles per hour. Feel free to contact us with any other questions. Q: I want to make sure that this will fit my 2015 Silverado 5.5 ft box. It's says it fits 5.5 to 6.8 and I'm not sure how that's possible I want it to fit correct. Will this fit correctly on my 2015 Chevy Silverado crew cab 5.5 ft bed? A: For specific compatibility issues with this tent it is a good idea to contact Phone 801 508-2880 to confirm. Q: Will it fit Toyota Tacoma Double Cab 2016 with 5 ft befit is just 4" off? A: This will not fit a Toyota Tacoma I am sorry to say. If the new model is a different size, then you can call 801-508-2880 to see if it will work. 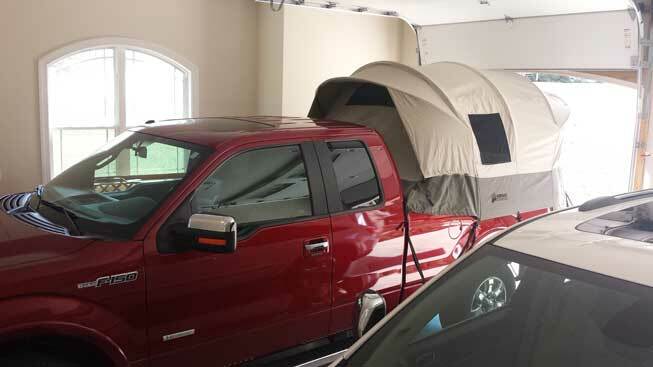 Q: I just purchased a ford F150 4 door extended cab, is this the tent that will fit that type of truck? A: This will work with an F-150 IF yours is a different version, then you may want to call 801-508-2880 to check. Q: Will it fit a 2006 1500 Silverado short box? A: It will fit a Chevy Silverado, You may want to call 801-508-2880 to check. Q: The metal poles, are they one piece or two? If one piece how do they store? A: A: Please call 801-508-2880, to find our how the poles store. A: We have great News! We just released the 7211 Mid sized truck tent that fits the Toyota Tacoma. Q: I have a new 2016 Tacoma long bed (6.2' long) ... This is considered a full size truck ... Will if fit this new truck? Q: Where can I see this in person? A: Unfortunately, these are out of stock until the end of November and we do not have any for display. Q: Can I drive with it up as a tent and if so how fast? A: Driving is not recommended unless you are going very very slow. The design of the tent almost acts like a parachute should you drive any faster than, say, ten miles per hour. Feel free to contact us with any other questions. Q: Hello, my name is Chris and I am living in Abbotsford, BC. Canada. 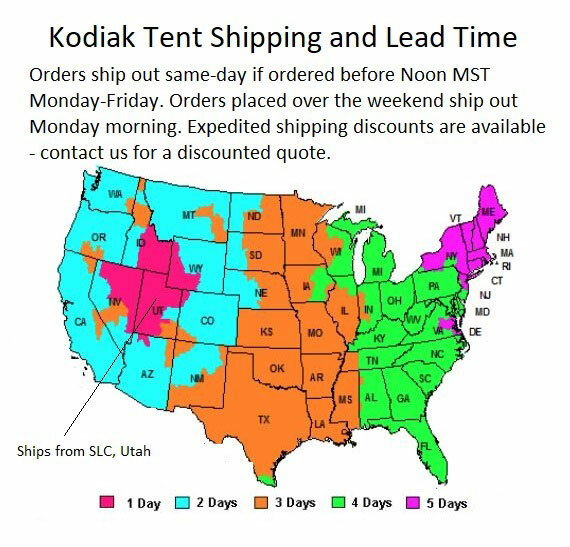 How much it will be to ship here one Kodiak Canvas truck bed tent? How many days will it take to be delivered. Thanks. A: We do ship these to Canada, but the shipping cost is not included, Shipping to Abbotsford would probably cost around $90, to check for sure, just add the item to your cart, and then input your zip code to calculate it. It takes about 7 to 14 days to Canada. Orders placed in the morning ship out the same day. A: Currently the color shown in the picture is the only available color. Most of our Kodiak Tents have the same green and tan coloring. Q: Curious what the shipping time on this item is? A: These generally ship out the same day they are ordered, from Salt Lake City. Depending on your location it can take 2 to 5 days to receive. We ship them FedEx ground, but we do offer expedited shipping. Feel free to contact us with any other questions. A: It will fit in a Chevy Silverado, I am not sure about this model, you can contact the manufacturer at 801 508-2880 to make sure. I estimate that set up time will probably take around 10-20 minutes, but it will take longer the first time. Q: Will the Kodak canvas truck tent fit in a 2008 Toyota Tacoma access cap bed ?? Q: Hi... VERY interested in your tent... I have a 2015 Chevy Silverado extended cab. I also have a quad fold hard Tonneau cover... is this tent workable with this set up? A: Yes I think that it will work with the cover . Just be sure to have a 2 ½ inch x 3 ½ ft place to mount the rail pole flat on the top of the truck bed. You will need to get after market C clamps that are deeper to make it work. Q: Will this tent work on a 2012 Honda Ridgeline? A: It will not work I'm sorry to say. Q: Is this unit complete with everything I need ? Q: do you make a tent for the Chevy Avalanche 2008 ? A: We do not I'm sorry to say. Feel free to contact us with any other questions. Q: Will this fit 2016 GMC double cab? A: I am not familiar with that truck, you could call Kodiak's customer service 801-508-2880 and ask. 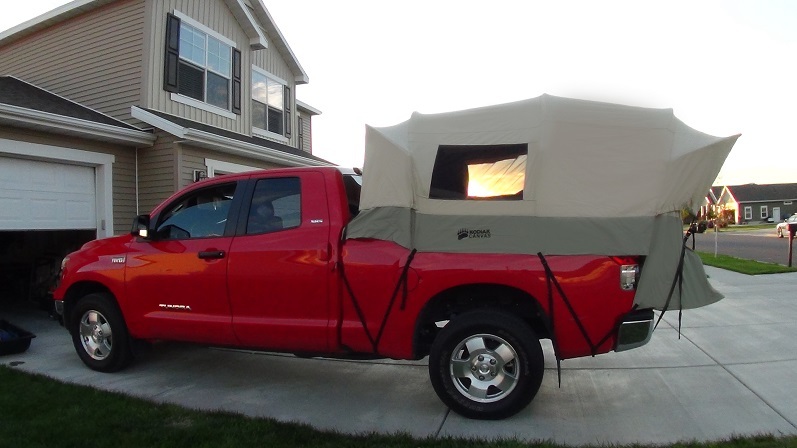 Q: does Kodiak canvas truck tent 7206 fit the 2012 Toyota Tacoma double cab sport package. I think it is a mid size short bed ?. 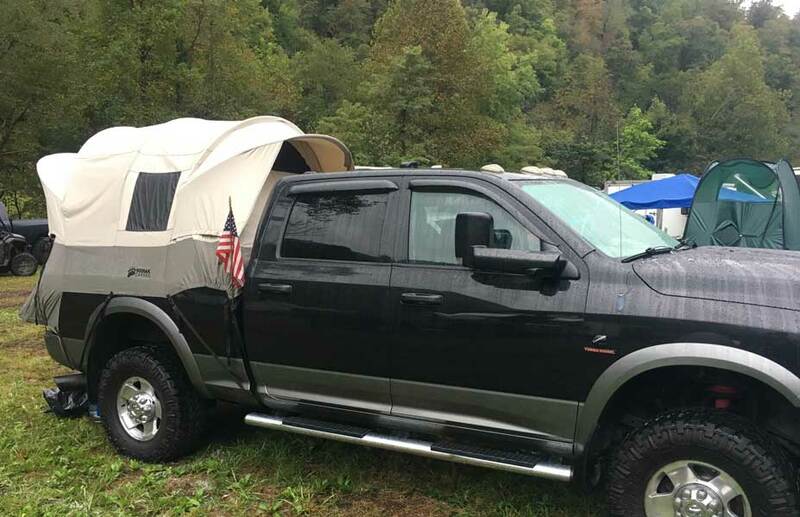 Q: Do you make a tent that fits a Dodge Ram 2500 with ram box bed? A: Unfortunately we do not, that will not fit this one. A: No, these don't fit on the ram box. Sorry for the bad news. Q: Will the tent fit a 1999 Ford Ranger Super Cab 4x4? Q: Will this tent fit a 1994 Toyota. Title says base model T100? A: Yes, it would fit that. 77 inch long and 67 inch wide will fit. 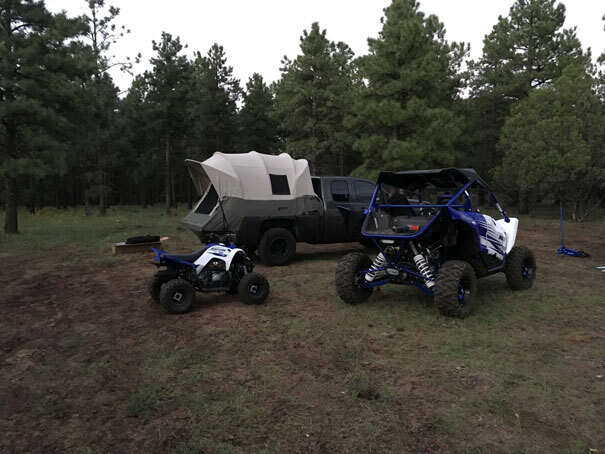 Q: Is there a tent model that fits a 2005 4x4 Toyota Tacoma quad cab long bed? My truck is close to the same width as a Chevy Silverado truck I understand that you do not have a short bed version for the Tacoma 4x4 quad cab a is that correct? Q: Will this fit the bed of a standard Ford F150? What is the free cargo net for? A: Yes, it would fit. The free cargo net is simply a gift. Q: I have a 2002 GMC Sierra long bed with a toolbox behind the cab. Just wondering which tent to order (long bed or short bed version). Would the tent built for a short bed truck fit behind the toolbox without having to remove my toolbox? Or would I have to remove the toolbox to set up the tent regardless of what size I bought? A: Yes, you will need the long bed tent 7218. Most of the time the tent will fit over the toolbox but if it has any sharp edges you will need to cover them with some tape. 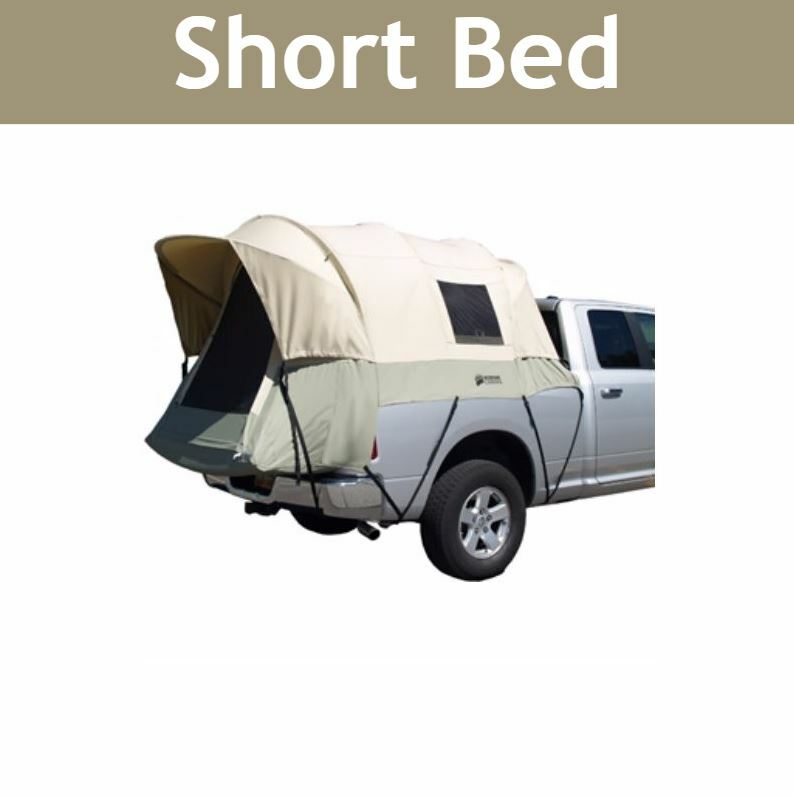 Using the short bed tent and leaving the toolbox exposed on the truck will not work. Q: Will this fit my Quad cab 2011 Toyota tundra? Q: I own a 2013 Nissan Frontier, Crew Cab. With the tailgate down the bed is 6' 8", will this tent fit my truck? A: We have great News! We just released the 7211 Mid sized truck tent that fits the Nissan Frontier. Q: How does this size down to a 5.5 bed on a 2016 Ram 1500? I'm concerned about how it fits if it's made to fit a bed up to 6.8 ft. Also are there strap covers that will protect the paint job on the truck? A: On the shorter beds our tent simply has more slack. The closer you get to 6'8" the less slack there is and the tighter it feels. It also has straps to make it fit nice and snug. The strap covers do not have anything to protect the paint job on the truck. If you are concerned about that or you have paint that is already chipping and susceptible I would recommend possibly putting something in between the strap and your truck. Although I've never heard of anybody doing that. My father-in-law has one on his brand-new truck and he has never had any issues. Q: Which types of trucks will this be compatible with? A: Please review our compatibility list on this listing. It shows you which trucks it is compatible with and which models it doesn't work with. Q: Which trucks will this work on? A: Please allow me to refer you to the compatibility chart at the bottom of our listing. Q: What types of truck beds will this fit in? A: It fits most trucks, but please take a look at the compatibility chart we have on our website. Q: What types of trucks will this tent fit inside of? A: Please see compatibility chart in the description. Q: Will this keep my truck bed dry or will it soak? A: It will definitely keep you completely dry. If you get wet, the tent was either not put up correctly or it's defective and would be covered under warranty. I have been in this truck tent in some severe rain, and worried that I would get wet, but I did not get a drop inside. Q: I live in a cold place and I need to know If this withstands the cold? Dimensions: 49" x 11" x 10"